It should be no surprise that laptops are one of the biggest targets for thieves, whether you’re on the road or at home. The loss of your laptop would not only bring the financial sting of losing a valuable item, but also the loss of your data, which you may not have backed up recently, and the concern of whether there’s any sensitive information on your laptop that could be disastrous for you or your company should your laptop fall into the wrong hands. There’s a variety of offerings when it comes to locks specifically designed for computer and laptops, but many of them are poorly made, poorly designed and easily defeated. 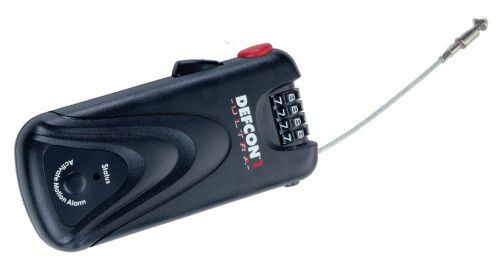 Some use steel cables which are simply too thin; some use the round, barrel-style keys which are known for being easily defeated; some use 3-digit combination locks which can be defeated by anyone with enough time (under 2 hours) and patience to try all 1000 combinations; some use lock mechanisms which can be defeated in a matter of seconds. Don’t take my word for it. Have a look at the following videos from YouTube. With the above in mind, take a moment to consider a well-known rule amongst security experts: for someone who is determined enough, there’s always a way to get past a lock, an alarm, or whatever security measures are in place. All you can do is slow them down, frustrate them, make them worry about getting caught and decide it’s not worth their time. None of the recommendations below are fool-proof ways of keeping your laptop safe – but any of them are better than nothing. First, keep your physical location as secure as possible. Consider how hard it would be for someone to get into your room through the windows, especially if someone can walk right up to them, but also consider how hard it would be to climb up to them or to a balcony door. Don’t leave your windows open when you’re not there. If you’re traveling and staying at a budget guesthouse or resort where you can use your own padlock on the door, use one – and make sure it’s a good one. Don’t trust the padlock given to you by the management. They’re probably honest people, but a local thief might be familiar with the type of locks they use and know how to get past them quickly. Next, assuming that someone does find a way into you’re room, your goal is to make sure that they can’t simply grab your laptop and head out the door in a flash. From this perspective, any lock is a good start, because they simply may not be prepared for it and not want to risk sticking around trying to get past it. However, if they have some idea of what they’re doing, whether it’s due to YouTube or due to their own experience, you want to make sure they have a hard enough time that they start to panic and abort their attempt. That’s where the options below come in. The DEFCON 1 Ultra is retractable steel cable lock with an electronic alarm and motion sensor. Most laptops have a small, rectangular lock-slot built into the body, often on the back corner. Virtually all laptop locks depend upon this slot for their purposes, so make sure yours has one before buying any laptop lock. After inserting the included adapter into this slot, you run the cable around an immovable object, such as a pipe, or something difficult to move, such as a bed or chair. While the cable isn’t very thick, the protection comes from the fact that if the cable is cut, a 95-decibel alarm will sound that will surely put any thief into a panic, hopefully making them run in fear of being caught. It also features a motion sensor, so if the lock is moved around too much, the lock will first start “chirping” as a warning, and then unleash the full alarm if the motion doesn’t stop or the lock isn’t properly unlocked. The lock itself is a 4-digit combination lock giving you 10,000 possible combinations, ensuring that any thief would have to sit there for a long, long while to try to crack the code, but also giving you the convenience of not having to worry about carrying (and losing) a key. You can get it at Buy.com for around $42 with free shipping. Note that one online review claimed it wasn’t too difficult to remove the 3 AAA batteries while the device was locked, which would disable the alarm and leave the scant protection of the thin steel cable. Even without removing the batteries, I wonder how hard it would be to disable the electronic alarm by other means. That said, anything which makes loud noise is surely going to make a thief think twice about experimenting – and I’ll address this possible weakness below. Also relying on the lock-slot built in to your laptop, this lock is Kensington’s highest-grade model and it appears to be the best you can get as far as non-electronic laptop cable locks go. It’s a keyed lock, and the important difference here is that it’s a multi-disc lock that uses a flat key instead of the round, barrel-style keys which are common on so many other locks and known for being easy to defeat. It uses a 6-foot long (183cm), 0.18″ (4.5mm) thick carbon tempered steel cable core with external steel braided sheath, which I presume helps hinder any attempt to simply cut the cable. While no cable is any match for a serious cutter, this will surely hold up better than the cable on the lock in the YouTube video above. It’s available at Amazon for about $44 with free shipping. If you have an ultra-thin notebook such as a MacBook Air or Lenovo ThinkPad X300 series, you may want to opt for the Kensington MicroSaver DS Keyed Ultra-Thin instead – but bear in mind that its cable is a foot shorter at 5 feet. While the locks above are ideal for keeping your laptop locked while you run out for lunch, they do have their drawbacks. First, there’s the obvious possibility of the locks being defeated and a thief running off with your laptop. 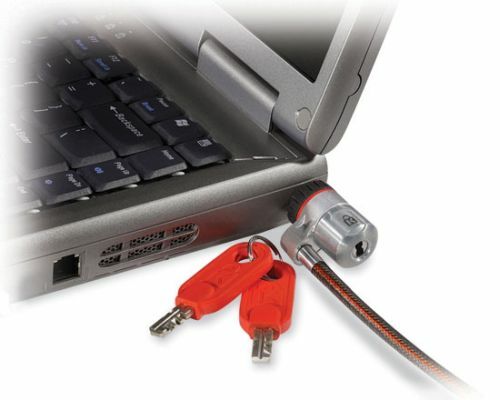 Second, laptop locks still allow physical access to your computer. If the thief is after your data, then the lock is of little concern to them, because while the lock may keep the laptop in place, it does nothing to prevent them from opening your computer and removing the hard disk – something that can often be performed with the simple removal of one screw. This is good reason to use disk encryption software if your laptop has sensitive data and to make sure your laptop is set so that you always have to log in when you turn it on, but even these measures can be defeated, so it’s better to make sure that a thief never has physical access to your computer in the first place. This is where Pacsafe bags come in. Pacsafe makes a variety of travel security products, but their most innovative products in my opinion are their Daysafe backpacks and Travelsafe bags. 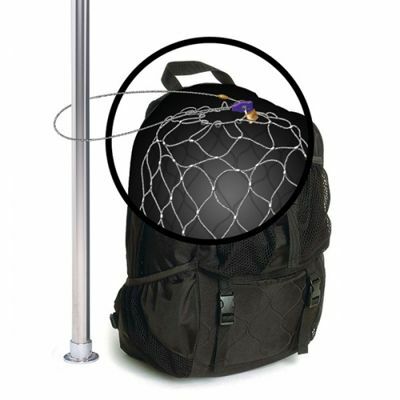 They feature a secure bag that is essentially a steel-mesh cage laminated in nylon fabric which can be sealed shut and locked to a fixed object by an attached steel cable. The bags are large enough for your laptop with additional room for your digital camera, camcorder, external hard drive and smaller items like your passport and extra cash. I’ve personally used the Daysafe 100 and Travelsafe 12L on my travels, and I now consider having one of them as essential for any of my travels. They may not stop a master criminal, but they go a long way in terms of giving me peace of mind when leaving my laptop and camera in my room. Both the DaySafe 100 and DaySafe 200 backpacks are available at Amazon . The secure bag is removable from both models, but if you really don’t see yourself ever using the backpack, you can purchase one of the Pacsafe Travelsafe Bag Inserts – either the 20L, similar to the one found in the Daysafe backpacks, or the 12L, which is slimmer but large enough for a large laptop plus some smaller items. If you want the ultimate security for your laptop without hiring an armed guard, then my suggestion is to use both a laptop lock and the Pacsafe bag – and this is where we come back to the Targus DEFCON 1 Ultra electronic lock. As I mentioned, that lock could be susceptible to defeat by removing the batteries or other ways of disabling the locks electronic abilities. However, defeating it requires physical access to it. If the Targus lock is placed inside a Pacsafe bag along with your laptop, the thief’s ability to get your laptop becomes substantially more difficult: If they cut the Pacsafe cable and start walking off with your bag, the motion sensor will trigger and the alarm will sound. If they try to cut into the bag, this too will be difficult without setting off the motion sensor – and even if they do manage to cut the bag open enough to gain access to the Targus lock, they still have to disable it, which would prove drastically more difficult through the cut hole in the bag than if it were sitting on table, and they still have to worry about setting off the motion sensor. Note, however, that if you implement this double-layer security measure, you too will have to be careful not to set off the motion sensor when opening the Pacsafe bag, so you might want to practice at home first. Even with the best security measure you can get, there’s the chance your laptop will be lost or stolen. Assume that it will happen and be prepared in case it does. Back up your important data, whether with external drives or online backup services – ideally with both. Make sure your sensitive data is encrypted so that if a thief does get your laptop, they can’t get your data. Finally, you can use software solutions to attempt to get your laptop back if it is stolen and the thief is foolish enough to get online with it. Look into free software called LaptopLock or even using a dynamic DNS service to find the IP address of your laptop, which you can then give to authorities in hopes that they’ll use to track it down (though this is reportedly optimistic). If you want a more hardened solution and you’re willing to pay for it, check out Lojack for Laptops . But remember, the best solution is to make sure that your laptop never gets stolen in the first place. You might want to modify this article to let readers know not to waste a lot of their time looking into Pacsafe if their laptops are larger than 15″. Great article, other than that. Which Pacsafe products did you try? The Pacsafe 20L is “designed to fit most 15-17 inch laptops” (according to Pacsafe). I own one myself and after taking out the tape measure I can confirm that it’s definitely large enough to fit at least some 17 inch laptops.